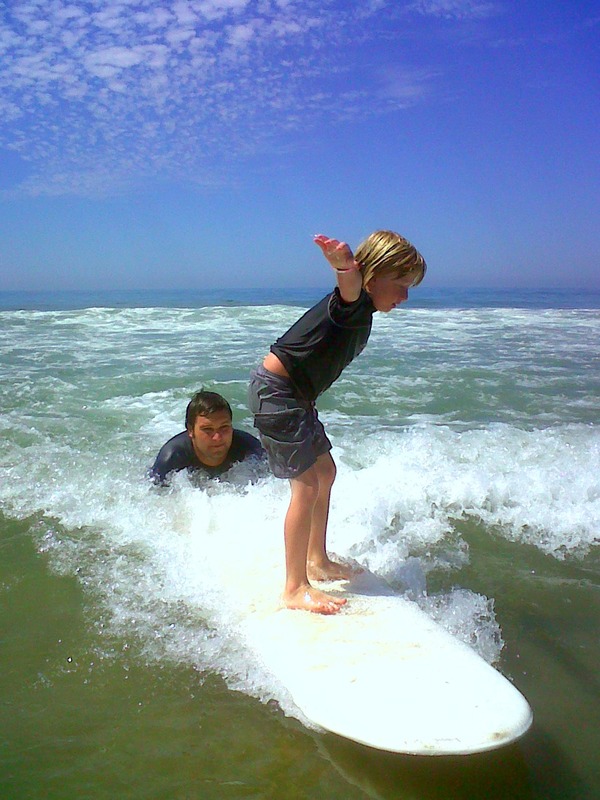 One of the benefits of attending Aloha Beach Camp is our convenient transportation service. It's totally free when you sign up for camp. 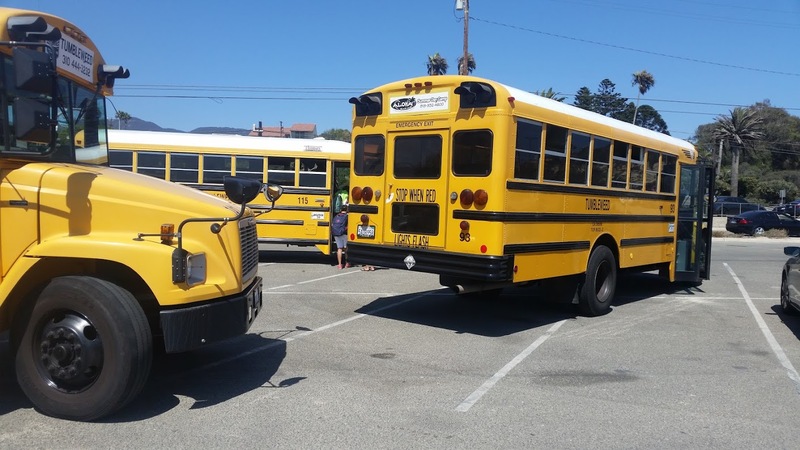 If your job schedule prevents you from driving your kids to camp yourself, or you just can't stand the thought of braving beach traffic every day, our bus service is the solution. Just sit back, relax, and leave the driving to us. Will this be your child's first time on a bus? 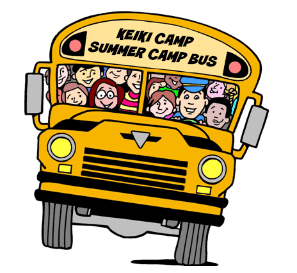 Even though our transportation service is helpful for many people, we realize many Keiki Campers, given their age, have never been on a school bus before. This fact has the potential to cause both excitement and anxiety. We want to help make sure your child's first-time bus experience as worry-free as possible. The best way to do this is by ensuring your camper has at least some familiarity and sense of security before boarding the bus the first day of camp without knowing what to expect. So here's what we suggest. Please make your plans to attend our Sunday, March 19, 2017 Open House. We will have an actual camp bus at the open house -- the same kind your child will ride to and from camp this summer. You and your child will be able to board the bus and even take an actual bus ride at the open house. This way you'll both be fully prepared for what to expect before camp even begins! Pretty cool, right? 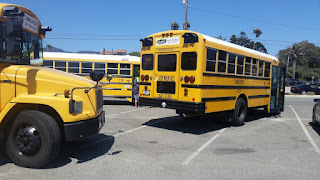 The picture above shows the actual bus or buses you'll be able to ride at the Open House, and the actual beach parking lot where you'll ride them. We're just talking about quick 5-minute shuttle inside the lot so you and your camper can get comfortable. Now there's just one more thing we need to say. Even though the open house is entirely free, you do need tickets to get in. Just one ticket admits your whole family. Get your free open house tickets here, and we'll be looking forward to seeing you March 19! 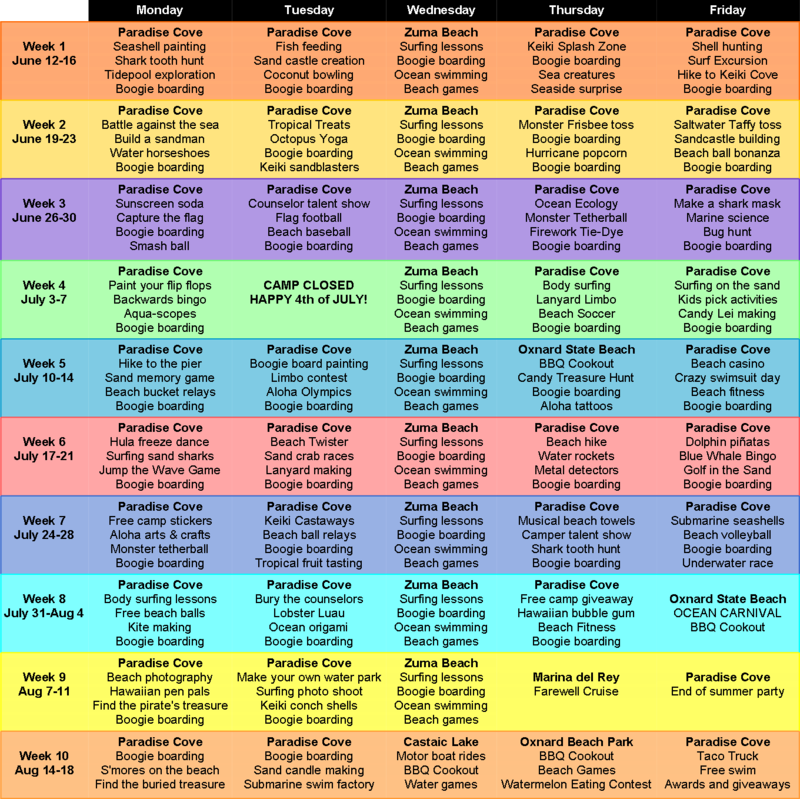 We've just finished planning Keiki Camp's Master Daily Activity Schedule for summer camp 2017. Check out all the fun things you'll get to do at camp each day. And remember, you can register your child for camp day-by-day whenever you want. That means you can pick as many or as few days that appeal to you, and only sign up for those days. 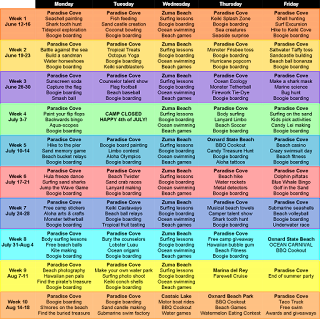 We don't have any prearranged enrollment sessions at Keiki Camp, so you're free to create your own camp schedule. Pick one day, two days, 20 days, or pick them all. Whatever works best for your family's busy schedule is perfectly fine with us! 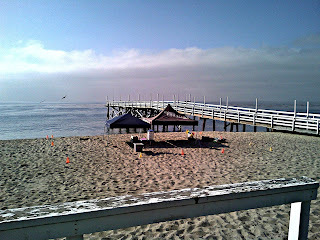 We are so lucky to have Paradise Cove as one of our program sites. 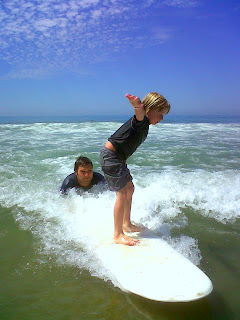 Aloha Beach Camp's Keiki Camp takes place at Paradise Cove on Monday, Tuesday, Thursday and Friday all summer (most Wednesdays we're at Zuma Beach where campers enjoy surfing lessons by our staff. If you are looking for a day camp for your preschool age child this summer, we hope you'll consider Keiki Camp. 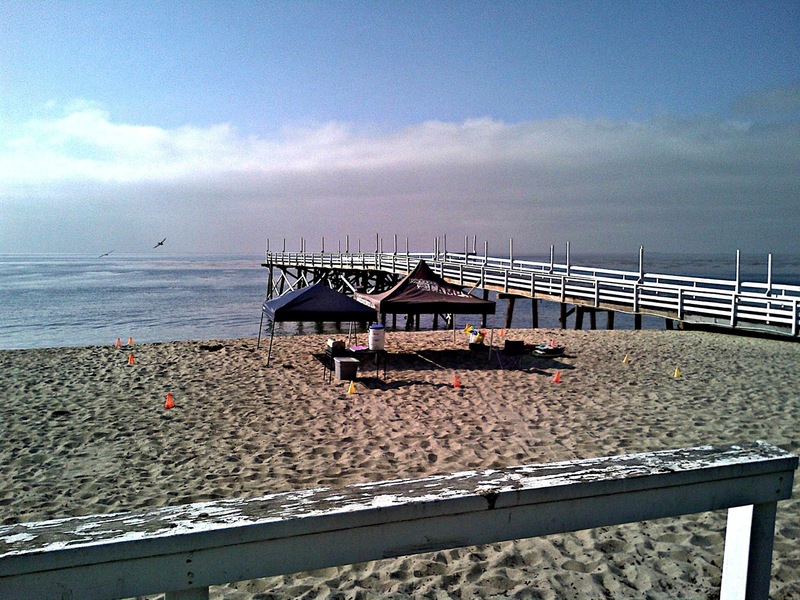 Paradise Cove, Malibu is the ideal place for a beach camp for younger kids! Duck-duck-goose is a fun game we play at summer camp! In fact there's many ways we play, as this video shows the "Backward Duck Duck Goose" game on the sand which the kids absolutely love.